Credit card rewards are one of the best and worst things to happen to personal finance since the discovery of plastic (Fun Fact: the first credit card was created in 1950!). They’re one of the best because when they’re used properly, you can leverage some wonderful benefits for spending responsibly. They’re one of the worst because it has led to the wild west in terms of using cards recklessly and having way too many of them. What does “properly” and “responsibly” mean? Responsibly means at the end of each month your credit card should have a $0.00 balance. You only put on what you can pay off. While I hope you read that statement and said, “duh, Chad, of course we pay it off each month,” that is unfortunately not the case for everyone. You can’t beat the interest with rewards if you carry a balance from month-to-month. I will say it again: you can’t beat the interest with rewards if you carry a balance from month-to-month. Most credit cards carry extremely high interest rates of 15%, 20% and even 30%+. So, if you think, “these rewards are awesome,” but you are paying an APR of 25%, you will not win. You want to know why there are so many credit card offerings? Because they are making money off of you! Think of the casino - the house always wins. Here is an example: Your washer & dryer flop, so you head over to the local chain store. They offer you 5% off if you sign up today for their credit card. The washer & dryer cost $3,000 – You think, “What the hell, I am saving 5%, go ahead and splurge.” Simple math says 5% off saves you $150, congrats. If your interest rate is 25%, let’s keep it easy and say you are paying 2.08% in interest on a monthly basis. This means that a little over $59 per month in interest (Based on $2,850) is accruing. Yes, this is a simple example since we are not accounting for minimum payments, interest free for X months, etc. Based on these numbers, you have less than 3 months to pay this off before the 5% discount didn’t help at all and the credit card wins again. To pay this off in 3 months, your payment would be around $990/m assuming the 25% interest rate and the 5% discount to start. Shout-out to the emergency fund for having our back in these situations. I love examples because it makes the circumstances more relatable. Let’s get to the good part now that the credit card shaming is over. This may seem like commonsense, but I am still amazed by how many individuals have travel cards but when we ask them about their last trip, they say it was years ago... The first goal of any great credit card rewards strategy is to find a card that matches your interests. Make sure you are picking a card that will give you rewards that you can and want to use. Do you want a free flight or money for your Amazon addiction? Do the employees at Target know you on a first name basis? Is the barista at Starbucks one of your top 3 friends? Does walking into Cabela’s feel like Christmas morning? Where do you love to spend money and how can you get the most in return for spending money both there and everywhere else? NerdWallet is a wonderful resource for credit card research. Use this list to view the Best Rewards Credit Cards. Credit cards are getting better with this today; however, many cards still have points that expire. Keep an eye on your point expiration, especially if you haven’t used them ever or for a few years. If you can make this an annual tradition, you shouldn’t have to worry about any expiration problems. Most cards will have time frames of 12-24 months for the ones that do use an expiration date. Read the fine print and make sure you are not losing your hard-earned rewards. Many travel cards come with both restrictions and “blackout dates” (not referring to a blind date with too much alcohol) on redemptions. Make sure you understand the details, and if you constantly find yourself in a difficult travel spot due to blackout periods, it may be time to look for a new card since there are many cards with no blackout dates. Best Travel Rewards Credit Cards. Pro Tip: If you are going to use your credit card rewards to order gifts or gift cards for your friends and family, do it sooner than later. These usually take a week or so for arrival which means no last-minute shopping! Cash back cards are preferred nearly three times more than travel cards (study from CreditCards.com). It makes sense since cash is the most flexible reward out there. Cash back cards will allow the “cash” to be applied towards your current balance, rewards, gift cards, and they will even send you a check if you prefer. Pro Tip: Go holiday shopping for your family and friends, and then use your cash back to pay the bill that month. For example, spend $700 on gifts and then use $450 of your cash back rewards to pay it down. New balance is $250, beautiful! Use one or two credit cards as your primary card(s). You don’t need ten credit cards, and if you’re not using them actively, you’re possibly hurting your credit score anyway. The best way to take advantage of credit card points and rewards is to only use one or two cards throughout the year. This will allow you to build up more points for better rewards. It is okay to dump less rewarding cards and cards not being utilized. Yes, canceling a credit card will lower your credit score for a period of time and it is usually only a small movement assuming it was not your longest credit history or credit limits. Use this article from CreditCards.com if you plan to cancel a card or a few. Pro Tip: With cybercrime and identify theft, it is much easier to track two credit cards rather than ten cards. Make sure you are checking your transactions and add email/text notifications for your cards (this is vital if you are letting cards collect dust). Use Them! In 2011, the New York Times noted that almost one-third of the billions of dollars granted in consumer rewards programs go unused each year. You earned them, use them! Watch the Fees. We usually advise against cards with fees since there are so many good “no fee” cards available today. However, we know individuals still use annual fee cards. Use Tech. There seems to be a lot to remember when it comes to credit card rewards, use technology to help you. Apps such as Smorecard and Reward Summit will keep up with the number of reward points offered for various purchases by each card and can recommend the best places to make certain purchases. Reoccurring. Another good practice is to put any recurring automated payments (utilities/bills/gym) on your credit card; you’re going to have to pay them no matter what. So why not get some points and rewards from those pesky bills. 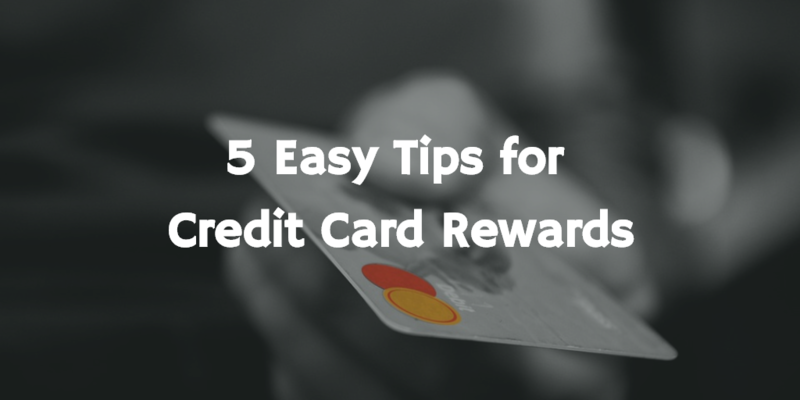 Use these easy tips to take full advantage of your current rewards or to help you on your search for your next rewards credit card. Please remember to use your card responsibly! There is a reason why it’s very easy (too easy) to get a credit card in today’s world - they know they can take advantage of consumers by charging insanely high interest rates!